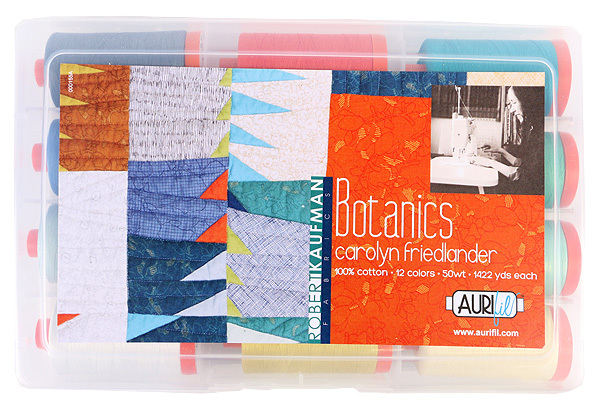 The new Botanics Thread Boxes by Aurifil Threads & Carolyn Friedlander are simply stunning. These threads coordinate effortlessly with the simple and modern Botanics collection by Carolyn Friedlander, and the modern quilt and sewing possibilities are almost endless. Today we are showing off this thread collection and giving some away to FOUR lucky readers! 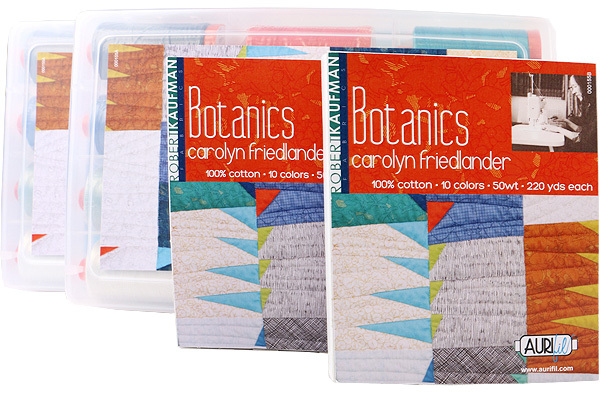 The Botanics Large Thread Box includes 12 enchanting thread colors to mix and match with your stash of Botanics fabric. From oranges to greens to blues, the entire Botanics collection coordinates beautifully. Each spool contains 1,422 yards of delicious 50 wt. 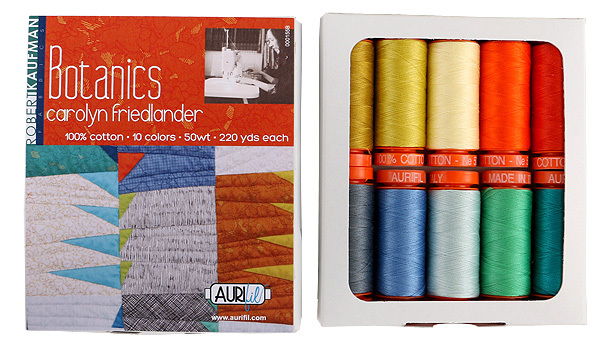 100% cotton thread, in the most magical colors. For a taste of the Botanics Thread Collection without the large commitment, the Botanics Small Thread Box is just what you need. The Botanics Small Thread Box contains 10 spools of thread filled with 220 yards of 50 wt. 100% cotton thread. As a little treat, we are giving away two of the Botanics Large Thread Boxes and two of the Botanics Small Thread Boxes. To enter, comment on this post letting us know what you would make with a big stack of Botanics fabric and a matching thread box. All four winners will be chosen on 5/2/14. Entry is open to all, and be sure to leave your email address! Good luck! UPDATE -- Our four winners have been chosen! I've decided to make a medallion quilt - either the one from Liberty Love or Gypsy Wife from Jen Kingwell. I really like Aurifil thread. I recently saw a lovely hexagon quilt at my local quilt store. These colors would be perfect for the pattern. I would love to make a quilted duffle bag! That fabric with that thread…YUM!!! I would make a picnic quilt, I don't have anything to lunch on in the grass!